Fatty acids are a type of carboxylic acids with a long aliphatic chain. Depending on whether the constituent fatty acids contain carbon-carbon double bonds, fatty acids are classified into two types, saturated and unsaturated. Fatty acids are considered as energy pool for organisms, as fatty acids produce large quantity of ATP when metabolized. Based on GC/MS (7890A/5975C) technology and coupled with fatty acid standards, MtoZ Biolabs can identify and quantitate over 40 kinds of fatty acids in your sample. 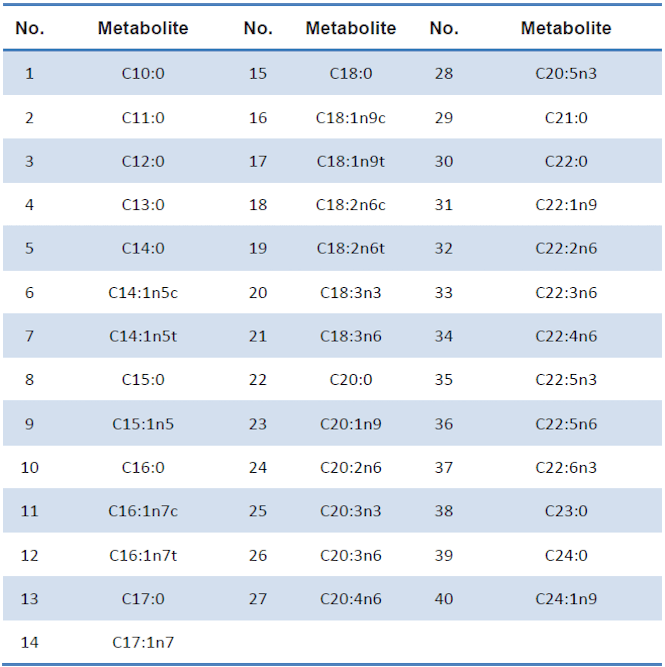 We guarantee accurate analysis of fatty acids molecules even in low abundance. With our optimized sample preparation methods, interference from high-abundance dominant metabolites can be greatly reduced, thus further increasing detecting sensitivity.